A groundbreaking study of the intersections of race and sexuality, by an all-star group of writers. From Selma and Stonewall to California’s Proposition 209 and the Defense of Marriage Act, blacks and gays continue to face resistance. Conservatives often lump these two groups together by arguing that both are demanding not equal rights, but “special” rights. In fact, gay rights activists have drawn parallels between their own struggles and the civil rights movement. Yet others have balked at any comparison, and conflict between the minorities has recently arisen. In an unprecedented undertaking, Dangerous Liaisons provides a platform for the leading minds of both communities, including those who straddle both worlds, to debate the volatile subject of the relationship between African Americans and homosexuals. 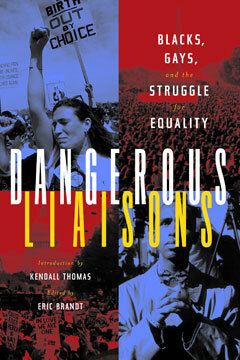 In eleven newly commissioned pieces together with five classic essays, Dangerous Liaisons addresses such timely issues as attitudes toward gay marriage versus attitudes toward interracial marriage; the growth of gay and lesbian rights organizations and homophobia in the black church; and conflict among minorities in the arts. Dangerous Liaisons presents well-known historians, political analysts, activists, artists, writers, and philosophers on minority relations in the struggle for legal, social, and cultural equality.